Starkweather Roofing is honored by our recent recognition from Firestone Building Products. A letter from Phil LaDuke, Director of Quality Assurance, and an accompanying plaque was presented to our team designating our achievement of Partner in Quality status again for 2015 (we are proud to have been recognized in 2013 and 2014 with this award as well). Starkweather Roofing is one of only 133 Firestone Building Products Red Shield Licensed Roofing Contractors in the United States, Canada and Mexico achieving this award. 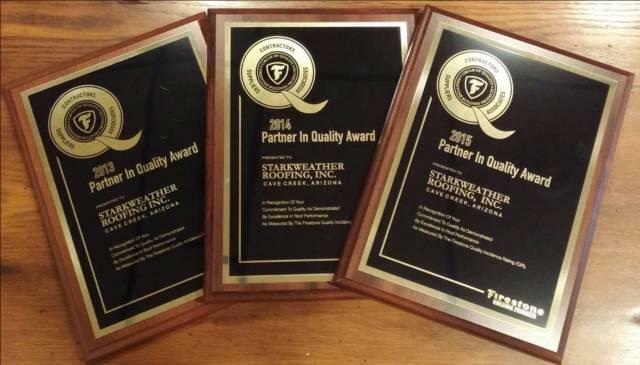 Starkweather Roofing had zero (0) repair incidents in 2014, installed at least eight Firestone warranty roofs in 2014 and four warranted roofs per year for each of the prior four years, maintained at least one million square feet of Firestone roofs under warranty, and have achieved an annual QIR of 1.25 or less (our QIR is 0.0 - the best possible score). The Starkweather Roofing team is thrilled by this recognition and look forward to continuing our partnership with Firestone and all manufacturers we are certified installers and approved applicators with to maintain the highest quality standards in the roofing industry. About the Partner in Quality Award Firestone has recently bolstered its quality measurement system to increase the impact of this program. The Quality Incidence Rating (QIR) offers a simple but compelling tool to promote roofing quality. Each year, this rating is computed for all approved roofing contractors by dividing the total number of warrantable repair incidents occurring on Firestone roofs by the total square footage of Firestone roofs under the contractor's warranty. Thermoplastic polyolefin (TPO) single-ply roofing membranes are durable, heat-reflective, energy efficient, and cost effective providing your building with exceptional resistance to ultraviolet, ozone and chemical exposure. TPO membranes come in a wide range of thicknesses, widths, lengths, and colors and are available from several different manufacturers. A solar-reflective white TPO roof membrane helps to reduce the energy required to cool your building by up to 40%, lowering your cooling costs. They also improve your buildings roof insulation performance, reducing heat loss in the winter and minimizing heat gain in the summer. They preserve the efficiency of your rooftop air conditioning units and can reduce your overall HVAC capacity requirements. NOTE: Even slight variations in one or more of these factors significantly affect price, quality, and longevity. To obtain a quote on a single-ply roof system, please fill out our short online proposal request form or email us with any questions.